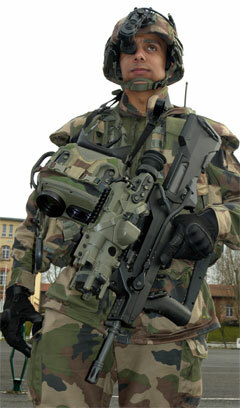 The first public demonstration of the FELIN system produced by Sagem, part of the Safran group, for the French army took place at Sarrebourg on February 8, 2011 at the 1st Infantry Regiment’s training zone. The 1st French Infantry Regiment is the oldest in Europe: indeed the unit was founded by Louis XI in 1479 and has taken part in all the main battles in French history; Valmy, Fleurus, Verdun, La Somme and the Resistance. This panorama also includes participation to the American War of Independence. The regiment will be deployed in Afghanistan at the end of this year. In the XXIst century, the 1st Regiment is the first unit in Europe to implement a full digitized soldier system for dismounted combat. It is a new revolution for the regiment, always the first. 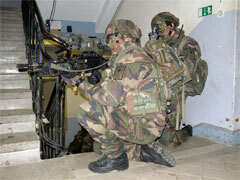 Direct assault, urban combat, stealthy advance in a dark building, offensive reconnaissance, neutralization of hidden enemies and site protection from an observation post and other operational scenarios closed out the FELIN technical orientation phase performed by this French Army unit. Following a six-week phase which completed these final tests, the unit transitioned to a new period covering the service entry of the system and its tactical integration. This phase will be followed by deployment in foreign theatres by the end of the year. The FELIN system has been delivered to the 1st Regiment on 7th September 2010, in others words 1000 FELIN systems carried by 18 trucks. 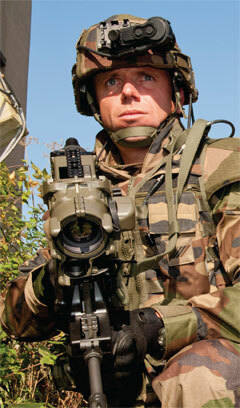 FELIN is an integrated equipment suite developed by Sagem for the French army as part of an overall soldier modernisation programme. It signals the advent of the all-digital battlefield for today’s ground combat troops. At the heart of the system is a “tactical vest”, including an individual radio with integrated GPS – a first for infantry soldiers – its processing unit, batteries and man-machine interface, namely a miniature terminal that displays data, including orders, positions of fellow troops, and images from gun sights for round-the-corner firing. Another innovative new item is the osteophonic headband. Placed around the soldier’s head, the headband captures or transmits via the bones of the skull the vibrations from the soldier’s speech or audio receiver. This ensures discreet voice communications in both directions, and leaves the ears free to stay alert to all outside noises. A keyboard on the rifle handgrip allows soldiers to control vital FELIN functions, radio and sight, while keeping their hands on the weapon, eyes on the target, and ready to fire. Squad and section leaders have larger terminals with a mapping function, dubbed SITComDE (dismounted warfighter information system terminal), that allows exchanging information with their troops and sending orders. In particular, the blue force tracking (BFT) function: this terminal tracks the positions of friendly forces in real time, for very effective control of operations. It also enhances intelligence, since it can transmit images from cameras integrated on sights deployed by FELIN-equipped soldiers. 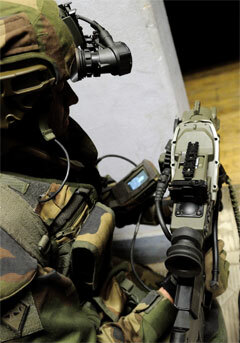 The addition of optronics equipment has considerably increased the effective firing range of FAMAS rifles, even at night. The new scopes are especially appreciated during different phases of combat, as one of the Regiment commanders explained, “The FELIN scopes give us new day and night firing capabilities. With the FAMAS rifle, our range now extends out to 400, or even 600 meters.” A squad leader added, “The FAMAS rifle now offers real long-distance sharpshooter capability. Furthermore, FELIN technology greatly increases our mobility.” At 400m, the unit recorded 100 percent shoot-to-kill rates and 70 percent at 600m, explained the officers of the Regiment. Observation and protection capabilities have also been considerably enhanced by the use of new JIM multifunction infrared binoculars. “The FELIN system design is an excellent example of human engineering,” said one captain. “It integrates all ergonomic requirements, while facilitating logistic support and durability. For example, the sight, binoculars and other equipment all run off the same battery.” It has to be noticed, that, JIM MR can improve detection of threats and C2, by transmitting observations to the soldiers within the combat group. In the near future, FELIN will receive a new radio, RIF-NG. Developed also by Sagem, RIF-NG (Réseau d’Information du Fantassin de Nouvelle Génération), a new-generation soldier information network is being developed to take account of the planned allocation of the 800 MHz bandwidth used by the RIF, the information network now used by FELIN-equipped units, to civilian 4G mobile networks. The RIF-NG will provide new services in addition to the phone and data functions that are already available on RIF, including radio relay, encryption and transmission protection. Deployed by each soldier and integrated in armoured infantry vehicles, the RIF-NG is designed to ensure continuous communications between soldiers and with vehicles, for both mounted and dismounted operations.